We pick up on our next leg of the Wild Atlantic Way – travelling from Skibbereen to Mizen Head in County Cork – after leaving Cape Clear behind us. This leg feels like “home territory” for me as I know the area well – my own family of Collins’ came from outside the village of Ballydehob. 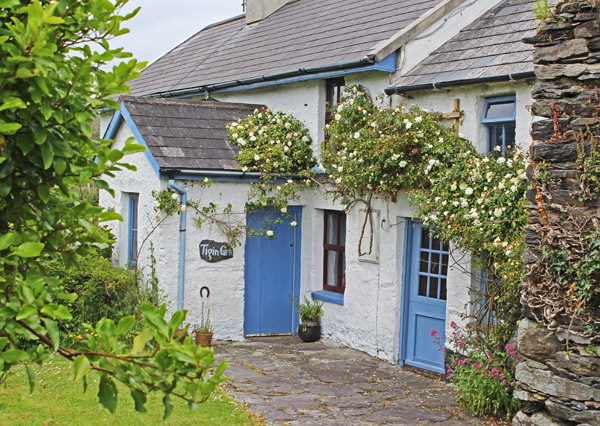 Skibbereen always presents a bright and cheerful face, specially on a sunny weekend. It’s the sort of town that I like to wander around – nipping into a coffee shop for a chat and a catchup – or wandering around some of the back lanes and roads. There is also a very good Heritage Centre in the town. Someday I must hop on a boat in Baltimore and sail up the river Ilen to the middle of the town – that would be a nice trip. 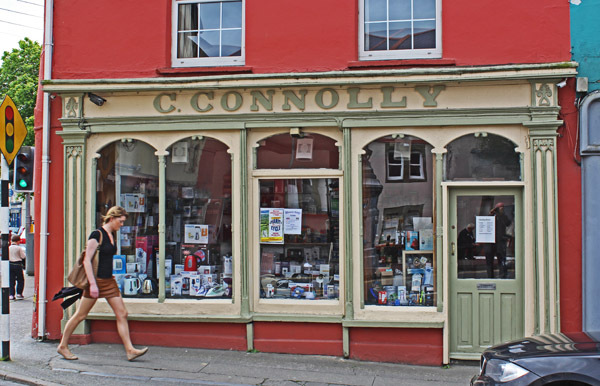 As you wander around the town, you’ll see lots of names over the shops and pubs that are found in quantity all over West Cork. 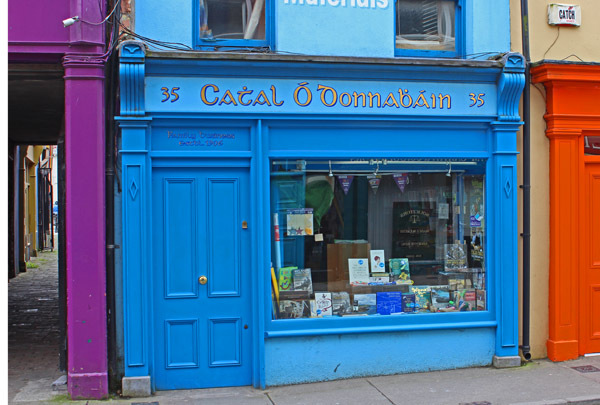 This area would have been under the control of the O’Driscolls, McCarthys and O’Mahonys a few centuries back – with plenty of Crowleys, Learys, O’Donovans and Hurleys added to the mix a little later. As we left the town, we made our way to Abbeystowery Graveyard. 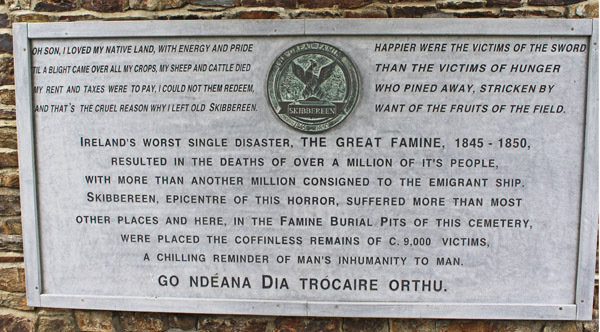 Skibbereen was one of the worst-affected areas in Ireland during the famine – and the memorial in this place reflect those facts. This is a Famine memorial at Abbeystrewery graveyard. The young man on the right (my son) has family buried there from his great-great grandparents back. But that’s not the thing. The thing is that there are about 9000 bodies buried during the mid-1800s in a mass grave in the small green plot behind the standing stones you see. Many of them were probably ancestors of the young man – and some may even be ancestors of yours. It does make you stop and think alright. 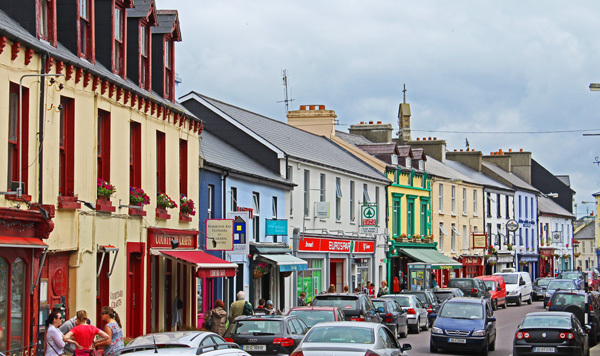 Ten miles to the west of Skibbereen, we arrived in the colourful village of Ballydehob. Sometimes the “Bally” at the beginning of an Irish placename comes from “Baile” – meaning town or home – and sometimes it comes from “Béal” – meaning mouth. In this case, the Irish for Ballydehob is “Béal an Dhá Chab” or “mouth of the two river fords”. I actually managed to get a picture of ALL of the twelve arches of the old railway bridge. No mean feat! As we proceed towards Schull the countryside gets even rockier. We could have travelled by boat at high tide in this lovely part of Roaringwater Bay – but a lazy car journey is no mean feat either. This road starts to get nice and spectacular – the looming Mount Gabriel to your right and the shimmering sea to your left. Lots of old homesteads and cottages dot the landscape in between. 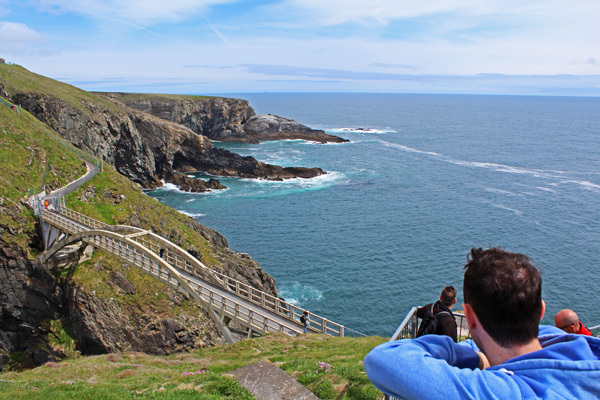 At this point we are entering territory that was ruled over a branch of the O’Mahonys many centuries ago – and we make our way towards Ireland’s most southwesterly point – Mizen Head. We were getting closer to the end of the peninsula – there seemed to be as much sea as land around us. 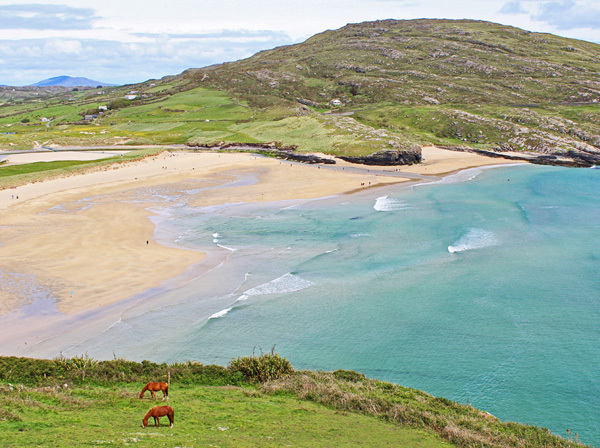 One of the nicest beaches in Ireland has to be Barley Cove – and for some reason the sun seems to shine here more than the rest of the County – a nice bonus! Along a last narrow road for a few miles we came to the Mizen Head Centre. Reopened about 3 years and offering easy(ish) access to some spectacular scenery. When you’re not admiring the view all around, there is a great story told about the life of the local light-house keepers. There is also something about the quality of the light and sea around here. There seems to be a different view every time I come as the light patterns change against the dramatic cliffs. And of course – there is always that photo-opportunity for your own “Titanic Moment” at the end of the viewing platforms. Just a couple of miles up the road (and across a couple of fields) lie the spectacular ruins of an old O’Mahony fort. This area is known as “Three Castle Head” and the castle is Dunlough castle. 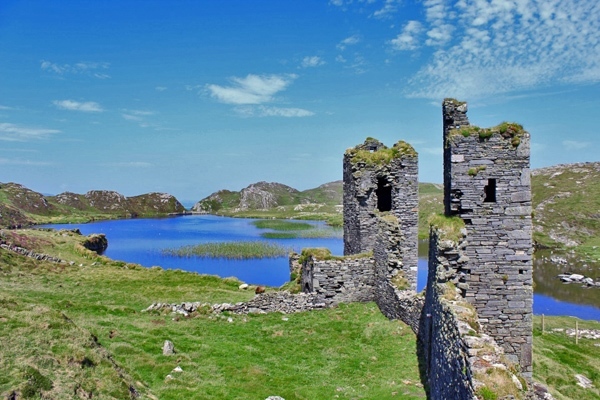 The castle ruins sit in a small valley at the edge of a lake – which in turn almost spills out over the nearby cliffs into the wild atlantic. This Castle was the point of final defence for the O’Mahonys. In the 1200s they had much greater lands through Cork, but were driven further and further west – here to the tip of the Mizen Peninsula by the McCarthys and the invading Normans. Well, that wraps up this leg of our trip around Ireland’s Wild Atalntic Way. Join us next time as we travel from the village of Durrus, all around the Sheeps Head Peninsula and back into the historic town of Bantry. And remember, feel free to leave your questions and comments below. Thank you for posting. We will be doing the same drive when we visit in September, and you photos and description have me very excited. Can I ask how long the drive to Mizen Head took? I will also be heading to the Beara Peninsula to investigate my O’Sullivan ancestors. Hi Lisa – great plant. From Cork City to Mizen it is about 2 hours driving without stopping. Beara is also beautiful. Mike. I have been told that my Grandfather, William Cottom, and his family, were from Skibbereen, but I cannot find any Cottoms. Anyone know any more? Mike, this is a wonderful and perhaps your best posting. 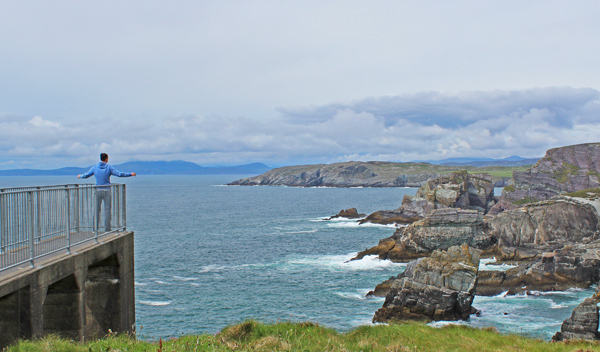 Breathtaking scenery and history of Skibbereen and the towns around it. Thank you. Pat Farrell. PS I see two of my family names listed, Sheehan and Sullivan. Hi Patricia – great to hear – more to come as we carry onwards! Mike. Hugely disappointed in Mizen Head yesterday. After being at Malin Head with all its beautiful (& free) views we’expected the same here. The way the building is situated all views are blocked unless you pay and walk some 90 steps/stairs (that take approx. 30 min each way) and that you are not warned about. Thats a pity Rita – sounds like it was a stressful visit for you. I agree that it can be quite tough on the walking/stepping and there should be a warning. But when you get there, I think it’s worth it. Mike. Love your comments about this area Mike. As my.people are from Caheragh I’ll be visiting this area when I am able to visit Ireland between Skibbereen and Bantry. Keep the info coming! What a beautiful area ! I see Regan and Newman in the list – don’r forget Roycroft and Camier in Schull and Ballydehob. Also Skuce in Coosane. Will make sure I have extra time to explore the area next time we visit. Hope to see Fastnet and not have it hiding in the mist and fog. Ballydehob is where my g-g-grandfather Humphrey Leary was born in 1807. He was transported to Australia in 1834. It is a beautiful part of Ireland and I hope to return there sometime in the near future. Hi Mary – sounds like there is a story behind his transportation! Lots of Learys still all around that area. Thanks for sharing, Mike. Love all this info!! So jealous of all that have names and towns from which search for their ancestors. My great grandmother was adopted when she about 14. We have no maiden name for her only first and middle. Hope to visit soon!!! Longing to find more of me!! Thanks Mikr for all you do to keep this going!! You’re welcome Tanisha – time to get planning that visit! Mike. A trip down memory lane!! In 2008 my sister and I visited Abbeystrowery, Schull, and Skibereen tracing the place from which our grandfather Richard Salter was born and left to begin a new life in Australia. Thanks Mike loved seeing some of the many beautiful places we visited. Delighted to hear Cheryl – thanks for sharing! Mike. Hello, and thank you for the wonderful pictures and article. After over 20 years of trying to discover the place in Cork were my family came from and having no success and thanks to a wonderful site ” Irish Genealogy .ie I have at last ben able to discover that they came to Greenwich, London from Goleen. I knew that my grandmother Catherine McCarthy was born in Cork ( all Greenwich census. I also knew from births in Greenwich that her mothers name was Hodnet ( sometimes two Ts ) I have not only discoved Catherines birth place but also that of her aunty Margaret Hodnet who also went to Greenwich.. I can only say that to have this information is better than a lottery win. The really strange thing is that we have been to visit Schull and Goleen five times and had no idea that I was walking in my peoples footsteps. I have been called there time and time again. I was privileged to attend the O’Donovan / Donovan re-union in 2000. it is the strangest thing, but I came to feeling that I had a right to be there and that it was not merely a huge privilege. My word, but the history, the longing and desire to feel that you belong runs through many generations and goes back many years. Please accept the crazy Irish diaspora and their yearnings. I see nothing written about castle Donovan. At the time we were told that the castle would be restored. did anything ever come of this. if so what is the progress? Mike, I just read that you are a Collins from Ballydehob! My GGGrandmother had Collins listed as Godparents on her baptism certificate from Schull, in 1810. And we were always told they came from Ballydehob. test should reveal connections, I am hoping. This just wonderful – and you have created such an amazing blog. 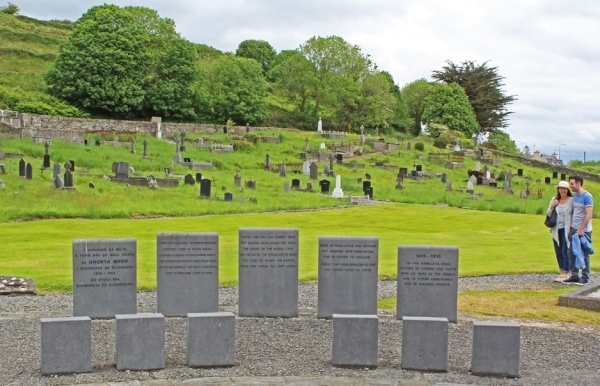 I am still recovering from knowing that Skibbereen has a mass grave for 9000 people. Utterly horrendous doesn’t begin to describe it. Reading about the famine in those parts is not an easy task but I’m kind of driven to know. Thanks again for creating this super blog! We had a wonderful time too and were blessed with fantastic weather!